All of our soaps are made right here on the farm with fresh, pasteurized goat milk. No other animal-based products are used. No artificial colors or preservatives are ever added. Our basic recipe is olive oil to moisturize, coconut oil for lather, and palm oil for a longer-lasting bar. We welcome requests, questions and special orders. Moisturizing Creme, Body Butter, Foaming Liquid Soap, Lip Balm, Brown Sugar Scrub, Bug Off Spray, etc. Gift Baskets, Soap-of-the-Month, and more! 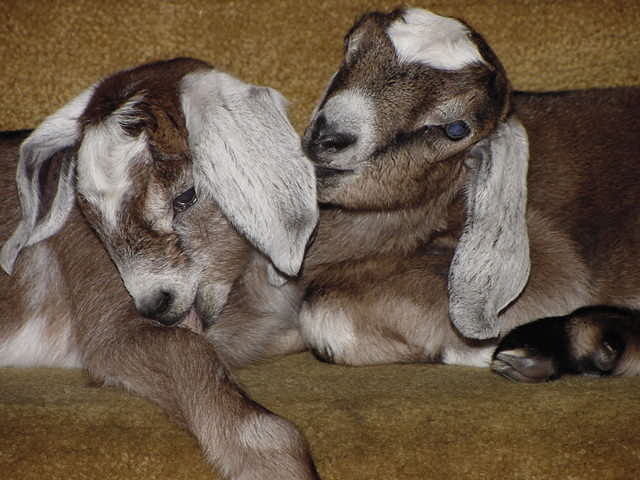 For pictures of our farm and goats, check out our Photo Page. For centuries, people have used milk baths to soften, smooth, and soothe their skin. Adding milk to soap lowers it pH, which helps to maintain the natural pH of skin. Goat milk, in particular, is less prone to seperation and trigering allergic reactions than cow's milk. Goat milk is also a natural source of Alpha-hydroxy acids.